Skeletal muscle - Hemorrhage in a male F344/N rat from a chronic study. Free erythrocytes are present adjacent to and between muscle bundles. 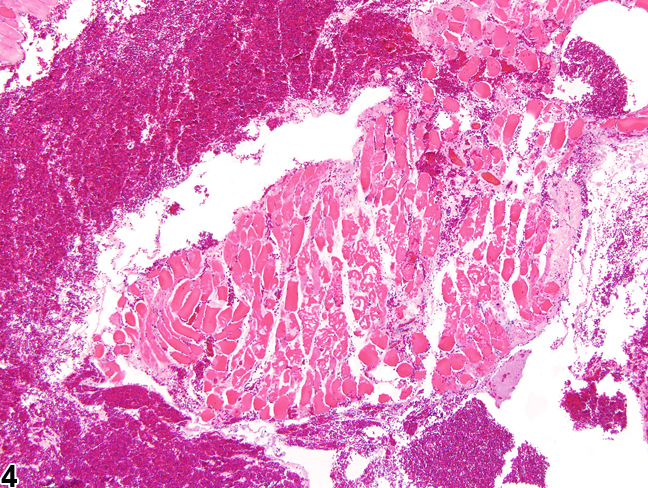 Skeletal muscle - Hemorrhage in a male F344/N rat from a chronic study. 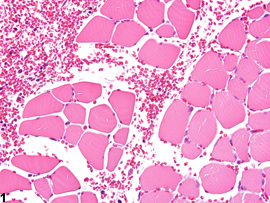 Erythrocytes and circulating leukocytes are present surrounding individual muscle fibers. 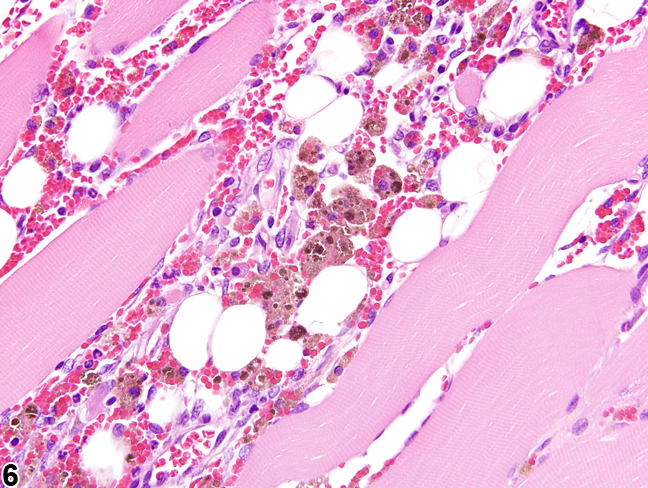 Skeletal muscle - Hemorrhage in a female B6C3F1/N mouse from a chronic study. 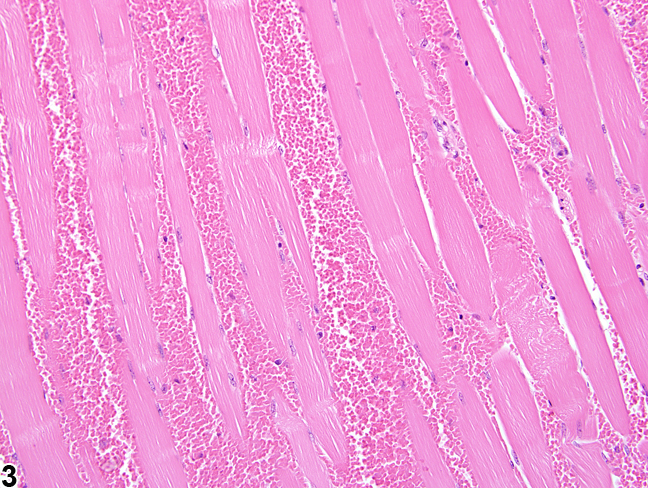 In this longitudinal section, erythrocytes are present between muscle fibers. 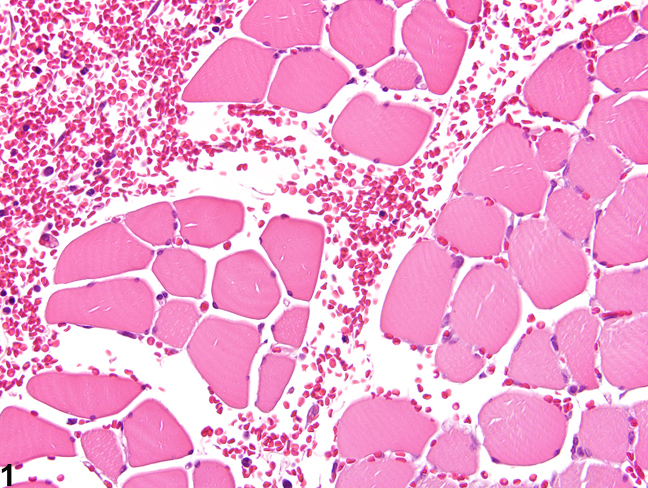 Skeletal muscle - Hemorrhage in a male F344/N rat from a chronic study. 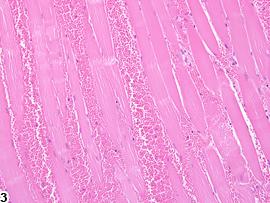 Large lakes of erythrocytes surround a large bundle of muscle fibers, some of which are fragmented. 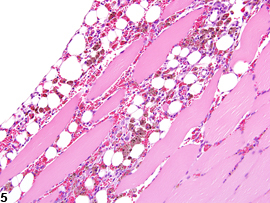 Skeletal muscle - Hemorrhage in a male F344/N rat from a chronic study. Macrophages containing golden-brown pigment are present within a region of chronic hemorrhage. 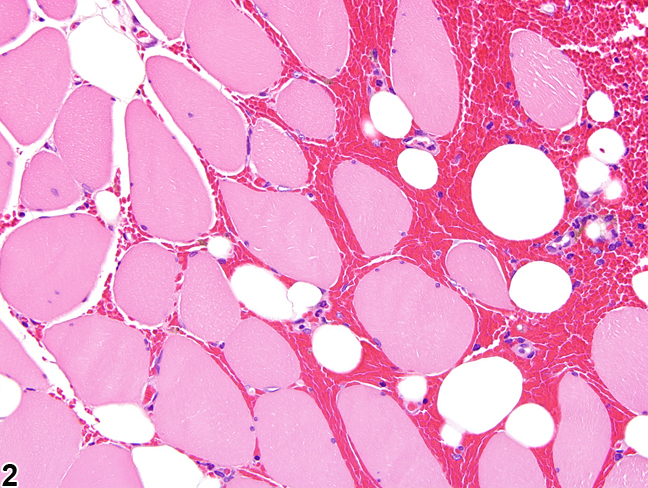 Skeletal muscle - Hemorrhage in a male F344/N rat from a chronic study (higher magnification of Figure 5). There are hemosiderin-laden macrophages within a region of chronic hemorrhage. Hemorrhage in muscle, as in other tissues, is histologically characterized by the extravascular accumulation of blood, which in the case of skeletal muscle separates and surrounds ( Figure 1 , Figure 2 , and Figure 3 ), and in some instances effaces ( Figure 4 ), adjacent muscle fibers. Depending upon the cause and severity of the lesion, myofibers in affected regions may remain relatively unaffected ( Figure 1 , Figure 2 , and Figure 3 ) or undergo degenerative and/or necrotic changes ( Figure 4 ). Lesions can range from focal and discrete to extensive and widespread. The presence of hemosiderin-laden macrophages within a region of hemorrhage ( Figure 5 and Figure 6 ) implies some degree of chronicity. Intramuscular hemorrhage typically occurs following an insult to the muscle, such as blunt trauma, intramuscular injection (injection site), or inflammation. Primary vascular lesions, such as aneurysms and vasculitis, and abnormalities in platelets or coagulation factors can also result in intramuscular hemorrhage. When present as a primary and significant change, intramuscular hemorrhage should be diagnosed and assigned a severity grade based on the extent of the lesion. The pathologist should thoroughly evaluate the tissue in an attempt to determine the primary cause of the hemorrhage (e.g., primary vascular lesions, evidence of trauma). Secondary myopathic changes do not need to be recorded separately unless warranted by severity but should be described in the pathology narrative. Hardisty JF, Elwell MR, Ernst H, Greaves P, Kolenda-Roberts H, Malarkey DE, Mann PC, Tellier PA. 2007. 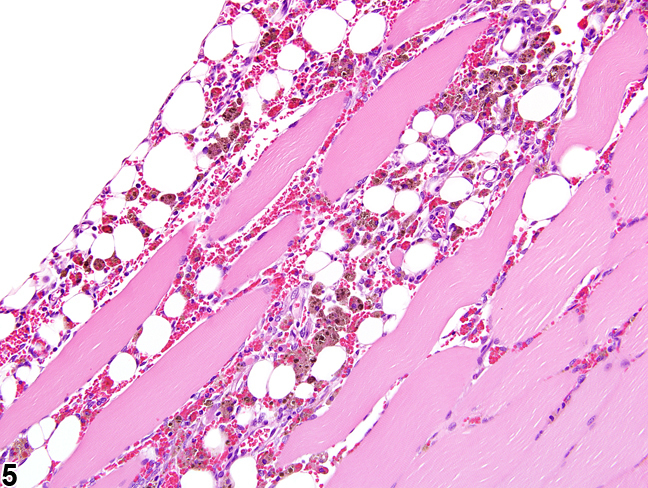 Histopathology of hemangiosarcomas in mice and hamsters and liposarcomas/fibrosarcomas in rats associated with PPAR agonists. Toxicol Pathol 35:928-941. Mosier DA. 2007. Vascular disorders and thrombosis. In: Pathologic Basis of Veterinary Disease (McGavin MD, Zachary JF, eds). Mosby Elsevier, St Louis, 63-100.